Depeche Mode’s Global Spirit Tour is gradually coming to an end (honestly, it is…) – a period when attention usually turns to what might be next. Nowadays, as the boys reach their late-50s, there is a well-trodden, four-year cycle to the Depeche Mode machine: record, promote, release, tour, and then a break of around two years. Side projects, rest, whatever it is they do after two years of being together, their downtime is almost upon them. The “what’s next?” question is always debated through the prism of age, inter-band relationships and creative energy. Inevitably, many fans predict with complete inaccuracy that the band will hang up their synths (?!) and enjoy an early retirement. That time is here once more, with fewer than 20 gigs to go and fans musing that the double Berlin shows coming up in late-July will be some kind of a celebratory farewell for good. Only those within the inner circle really know – the rest can just speculate… again. Which brings us to a show in New York – Dave Gahan’s home-town since the late-1990s. 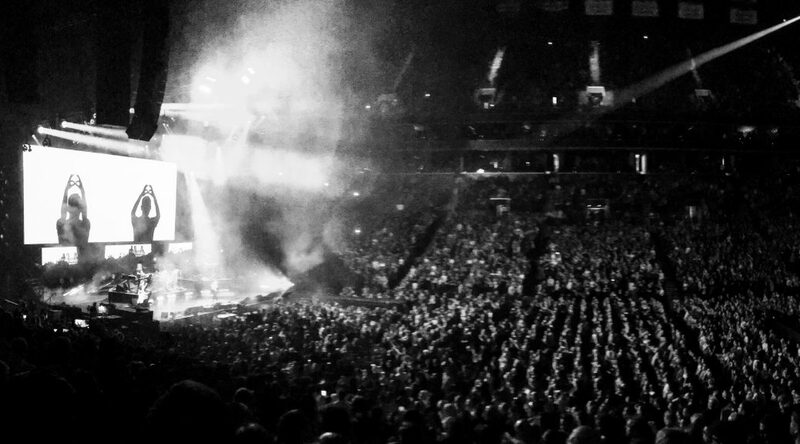 The band’s third night on the Global Spirit Tour in New York (the first two were back in September 2017 at the Madison Square Garden) brings them to the Barclays Center in Brooklyn, a fairly new and large sports arena that usually hosts a basketball and an ice hockey team. The gig is one that has come together very quickly for me – coinciding with a work trip to New York for a week and some extremely neat work on the ticket front by a colleague (thanks, thanks, thanks x !). The usual excitement at seeing the band again (whatever the critics continue to say, Depeche will always put on a good show) is tinged with a fair amount of curiosity for a newbie in the US. How tired will they seem after a year on the road? Will we get some jaw-dropping setlist changes? And, particularly for this show, what will the crowd will be like compared to their devotee cousins back across the Atlantic Ocean in Europe? Let’s deal with the second question first. The answer is, inevitably: “No”. The introduction of The Things You Said at the beginning of the latest leg in North America had certainly got the masses excited. And rightly so – it’s a wonderful song, played in its truest form akin to the live shows of 1988, albeit without Martin Gore’s high notes at the end and with Peter Gordeno doing a solid Alan Wilder impression on backing vocal. The rest of the set is as expected for anyone who has caught Depeche Mode over the last 12 months, building gradually to a chorus of anthems through the final half of the main set and into the encore. No surprises, and yet no sense of disappointment from the crowd (yes, we’re getting to them shortly). It’s remarkable, 100+ dates old, that none of the band seem in the slightest bit jaded or not enjoying themselves. Dave Gahan’s energy (and flexibility – there’s a great advert for yoga if I ever saw one) has not diminished in any other shows that I’ve seen. In fact, perhaps as the final handful of gigs swing into view, he’s relishing every moment and strutting, lurching, crotch-grabbing, bending and gesticulating to anyone who will look – i.e. everyone – more than ever. Gore himself is swinging his arms around wildly, conducting the audience as they sing along at the end of Everything Counts, for example. As a group, despite Andy Fletcher sometimes looking like the last one to be picked at the school ball game alongside the others, this is arguably the most unified the entire band has ever appeared, Gordeno and Christian Eigner included. In short: as has been evident since Amsterdam, Depeche Mode are seemingly enjoying life as Depeche Mode. For the devotees who monitor every utterance, every glance between band members, every twist and turn of a set list, this is A Big Deal. As a regular gig-goer at Depeche shows for nearly 30 years, one gets used to the crowds – how they react to certain songs, what they cheer for, where they congregate, what they wear. This is based on, until now, all the shows having taken place in Europe. Maybe it’s me, but over the years the crowds have got more Black Swarm-esque, hordes of devotees with their rituals and clothing. There is, whether we like it or not, a Depeche Mode style that is more prevalent than not in Europe. Across the pond, where Depeche Mode were initially an alternative band that gigged regularly and were popular on niche radio stations, they are perhaps now more mainstream than they ever got to be in Europe, especially in the UK. The crowd at the Barclays Center is not overwhelming clad in black, nor does it appear as riotous (not in the criminal sense, of course) or crazed or physical as a whole as perhaps many of the crowds are in Europe. This is not a criticism, just an observation as to how different some crowds at scale can often behave. The Barclays audience warms up properly for the first time during the wonderful opening bars of World In My Eyes – a song that sounds terrific in the vast arena and gets a wonderful response from the audience at the end. Thereafter, they sing and dance and cheer and clap (including a lovely mobile torch moment towards the end), yet some of the small moments that many look forward to in the set elsewhere do not happen. A couple behind me laugh and pretend to be annoyed when they realise that the traditional sing-along after the closing bars of Gore solo Home will not materialise, despite Gahan trying to encourage some action when a small section of the audience at the front, who know the drill, strike up. Yet for all this amateur social analysis (with no solid reasons as to why there are these small differences between European and American audiences), Depeche Mode are on terrific form, igniting a widespread waving of arms during Never Let Me Down Again that sets the tone through the encore, before disappearing off stage for the final time to a huge roar of approval. Another crowd heads off satisfied into the night after an excellent show – yet there is also plenty of talk (at least amongst those around me, and I suspect elsewhere given that it triggered the inevitable punditry on social media the following day) about the final few moments. Gahan’s farewell, swapping “next” for “another”, may just be a momentary, unconscious shift in language that was seemingly forgotten immediately after by the louche, evergreen frontman as grins and waves and laps up the genuine adoration that he and the rest of the band muster at every show. Yet the Depeche machine is so well-oiled these days, with many moves and phrases repeated every single night (“[City X], you really are the best!”) that those looking for a signal of an impending end to a near-40 year career are left thinking that they may have got it. Before it’s perhaps too late, I’m glad that I finally got to see Depeche in the country that has embraced them perhaps more than any other British band over the last three+ decades – it was a terrific experience. So, Gahan saying a final goodbye to his home crowd? In a sea of constant speculation within the huge fan base, as the Global Spirit Tour enters its final phase, perhaps 2 + 2 really does equal 4 this time. Or, who knows, perhaps 4.5. Everything counts in small amounts. Really interesting about the differences between the crowds in Europe and the States. And, yes, subtle differences but after lots of shows over the years you get used to certain elements of how a crowd behave, etc. Not complaining – was a terrific gig!